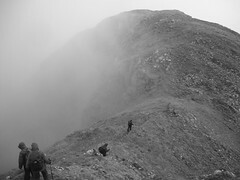 I was away hillwalking this weekend with a group of friends in Kintail, in the northwest Highlands near Skye. It is a beautiful part of the world, but one I had frequently passed through rather than stopping to explore, so it was nice to see something of the area. 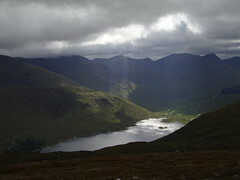 The weather was pretty rotten – as has been most of Scotland’s summer so far – but occasional breaks in the clouds led to some spectacular views. On the Saturday we conquered five peaks (including three Munros), and it was an exhausting but very satisfying day. The Sunday was spent in more leisurely fashion, exploring Glenelg and taking the ferry to Skye, a rather special journey as it is not only community-owned but also the last manually-operated turntable ferry in Scotland. Monday 27 June 2011 in Personal, Photography, Travel. These are really great photos – they really make me want to go on a nice long walk and ache afterwards.